It’s hard to believe, but 2019 is just around the corner! With the end of this year, we wanted to share our top wedding and couple photos of 2018. This has been a year of uniqueness for us and our brides and grooms. Each wedding had its own challenges, from full-fledged blizzard snow storms, thundering rain storms, and heavy haze, to frigid cold. With each challenge we noticed one similar thing about each and every wedding: the love that each bride and groom have for each other. We noticed how much this love helped them fight through adverse conditions during the day in order to make their wedding special for them. Even though this is just a glimpse into each and every relationship, it shows us the strength that each and every couple has for each other. Each wedding is as unique as the people being married, but the one thing we can always count on is seeing each couple support each other throughout the day. This is one of our favorite things to see on a wedding day, because each time we see the love couples have for each other, it strengthens our own relationship and marriage. 2018 was also huge year for our business with the changes that we’ve made. It was the first year of our renamed and re-branded business of Jessie and Dallin Photography. 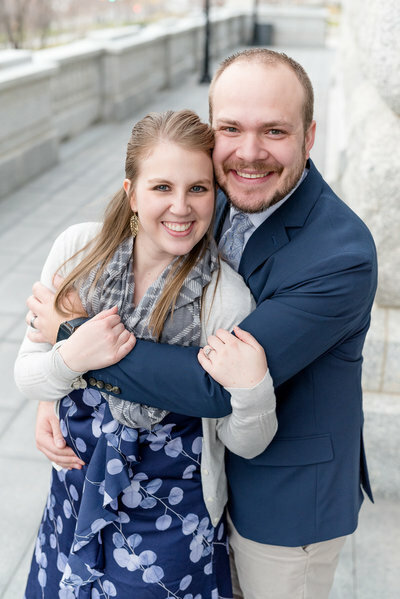 It was a much-needed change to signify the addition of Dallin to the business after being trained by Jessie as a photographer for the last few years. With this change, we’ve had a lot of website updates and other changes that we’ve made to make our business truer to us and our values. We couldn’t be happier with the changes we’ve made, and we are so excited to see how we grow this next year. We’ve also developed friendships with new vendors that have set up shop in Ogden and the surrounding area. It has been a blast to continue working with various wedding vendors that we hope to create life-long friendships with. None of these weddings would have been what they were without the other vendors hard work, and we are so excited to meet and get to know more wedding vendors and brides and grooms in our area this next year. Without further ado, we present our top wedding and couple photos from 2018!